NPO Foods is the manufacturer and exclusive distributor of Cache Lake™ Quality Camping Foods. We are a small company that offers great products and service to its customers. It began when Sharon and I (Billie), co-owners of an international mail-order optical business, became acquainted with the Secret Garden, a local company that produced gourmet food mixes. We brought the soup mixes home to our husbands and families. After tasting them, everyone was impressed with the taste and quality of the products. It was hard to believe that the vegetables actually reconstituted into flavorful, real vegetables. We were so delighted with the product that the question became, how could we, an optical supply business, share this great find with our customers. We picked our favorites, obtained the necessary licenses from the USDA, and began sharing them with our customers, first as gifts. The response was overwhelming. They wanted the opportunity to have them for themselves and to also give as gifts. Thus, NPO Foods was born and became a mini-division of National P. Optical. It didn’t stop there. My husband Bob, an Eagle Scout and avid outdoorsman, wondered how these great gourmet food mixes could be adapted to take along in the backpack. So with assistance from the friendly folks at the Secret Garden, Bob and I began the research and development of Cache Lake™ Quality Camping Foods. All of the products have been trail tested in the Boundary Waters Canoe Area (BWCA), this gives Bob the perfect excuse to make repeated trips back to the BWCA. We began marketing our product to the outfitters and camping specialists in the BWCA for the 1999 camping season and were were thrilled by the response. We then extended our marketing to several specialty stores in Minnesota and on the World Wide Web. We can now be found in many camping/outdoor shops in the U.S. and on trip outfitter’s menus around the country and in Canada. 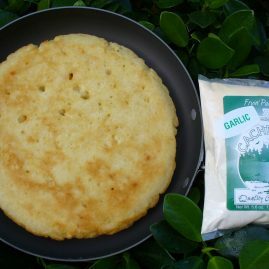 We are continuously expanding our markets in the U.S.
Cache Lake™ camping and backpacking foods are the lightweight, low cost option to freeze dried. Our food line is designed for experienced campers and backpackers who are tired of hauling meals that do not fill them up on the trail. The 4-6 oz. packed weight and small physical size make Cache Lake™ products ideal on the trail. For example, when reconstituted with water, Cache Lake™ soup mixes make a full 32 oz. (1 quart) of “quick cooking, belly filling, taste bud pleasing” soups and chowders. We call that our two serving size package. Every spoonful of wild rice and vegetables fills the need for bountiful camping and backpacking portions. The Wild Rice Salad is the only dehydrated salad product on the market that offers vegetables so tasty you will think they were just picked, and we combine them with nutritious quick cooking wild rice. If you are in a hurry, the salad can be prepared without any cooking. 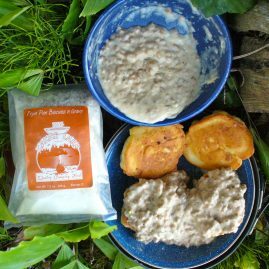 We have listened to the outfitters needs and continue to test and try new recipes that can be used by the outdoor enthusiast. In our first year, we added Creamy Fish Chowder, all you need is the water and fish. 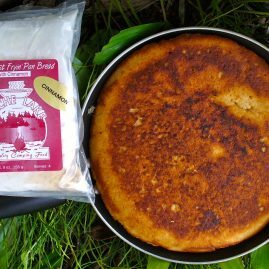 The chowder base is tasty just as it is, so the fish is optional, in the event you are “skunked.” The outfitters said they needed a lightweight, compact, easy to prepare bread, so we developed Fryin’ Pan Bread™. All you need is some water, a little oil and a fry pan. In about five minutes there is mouth-watering fresh bread to enhance any meal. It is so good and quick, we keep it on hand at home to add to any lunch or dinner. For the 2006 camping season, trip outfitters in the BWCA, asked that we consider adding more entree’s and desserts to our already tasty line of food. We answered their request by adding a whole new line of products, that we call OUTFITTER’S CHOICE. This new line includes some basic dishes that include a meat, vegetables in a gravy or sauce, with either rice, potatoes, or pasta. Some examples are: Chicken Ala King over rice, Beef Stroganoff with noodles, and Chicken or Beef with Vegetables and Gravy over Mashed Potatoes. Some really exciting new products include: vegetarian based Sloppy Joe’s with Fryin’ Pan™ Buns, Really Cheesy Mac & Cheese (with a 3 cheese sauce), and of course my famous chili, which we call Billie’s Chili. The desserts in this line are absolutely delicious. My goal was to make pie that tasted like pie, so I came up with four different pies: Lemon, Banana Cream, Pumpkin Flavored, and Chocolate. All pies have crumb crusts and the option of making them in the frying pan, for an optimum pie flavor, or for those in a hurry, a no-cook option as well. We have also found some really tasty vegetables that hydrate in about 10 minutes, or because they are so tasty they can be eaten dry as a quick and nutritious snack. 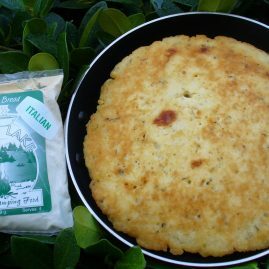 We are continuously testing new recipes and food ideas to add to our great line of camping/backpacking foods. It is an exciting time in our company. It is our pleasure to offer our products to the on-line shopper. They are just too good to keep to ourselves! In all we do, we look to God, our “CEO”, for direction and it is to Him we give all the glory for our success.